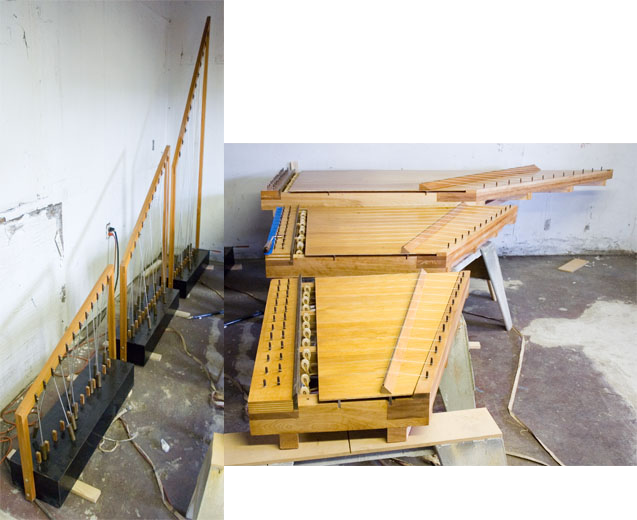 Pendulum Music is a sound-art piece that relies on continuously swinging pendulums to increment the playback of a MIDI file on a three-piece piano-like instrument. This results in a rhythmically disjunct interpretation of a piece of music based on the motion of the pendulums--each subsequent note is played only when the corresponding pendulum swings past its low point. Pieces are given a halting, probabilistic feeling, yet retain a vague familiarity due to their intact harmonic progressions. This is a collaborative work; sculptural artist Dan Knapp built the wooden components, and I am responsible for the software and interface circuitry. More specifically, I created: 1) circuits that sense pendulum motion and output status signals, while pulsing electromagnets to keep the pendulums swinging, 2) a 72 channel I/O computer interface that converts these status signals to USB MIDI events, and 3) software that interprets these events and applies an algorithm to determine the playback order of notes in a MIDI file based on pendulum motion. Pendulum Music was exhibited in 2007 at the Derek Eller Gallery in New York and in 2008 at the Little Lamb Gallery in Los Angeles.